B.E.L.T. reader George McNatt left a comment that this building at Brown and St. Charles Rock Road is going to be demolished. All of the buildings connected to it are coming down as well, starting this January 2013. 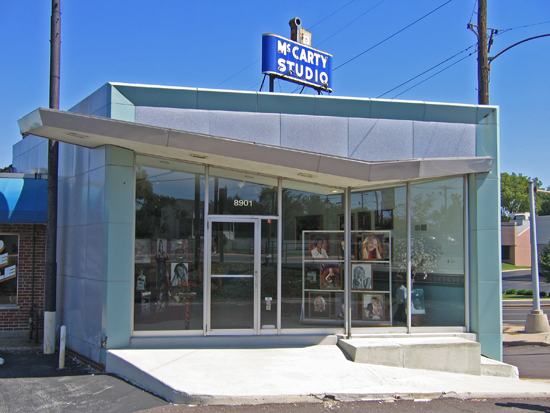 Here’s backstory on McCarty Studio. And why are these buildings coming down? If I told you there was a Walgreens on the opposite corner, could you get the answer with one guess? CVS was unsuccessful in Fergsuon (backstory here) and was shot down twice in the Central West End (both buildings spared from CVS demo are listed in this story). Guess they fared better in St. John, eh? George also reports that they are tearing down the building on the southeast corner of this intersection (map here) to put up a McDonald’s. Considering they are reportedly going in on the site of the former State Bank of Wellston once it comes down, McDonald’s looks to have a strong first quarter of 2013. This entry was posted in mid-century modern commercial, st. louis county, st. louis development and tagged brown road, cvs, mccarty studio, st. charles rock road, st. john missouri, walgreens by Toby Weiss. Bookmark the permalink. I used to live in a cute part of town with buildings that held memories. Almost overnight these buildings came down to make way for “progress” – so we welcomed all these commercial giants and the personality of this part of town was stripped away. It went from being a place proud of its local produce to a place that is driven by profit and consumerism. Sad. I hope that St. John realises the consequences of demolishing such buildings and replacing them with big business. I drove by there over Thanksgiving and drove past the intersection because I did not RECOGNIZE IT! Weirdest feelings. I did get pictures of the Lodge at one point. Whew. Sure hope they don’t takedown the rest of St. John’s miniature downtown strip on Brown. Caddy-corner where the Masonoc Lodge was, is the Mcdonlads. The CVS wiped clean more then the photography studio. No, this is for a CVS, which is simular to Walgreens. Of which there is one across the street at Brown road. The Mcdonalds in going across the street at St. Charles Rock Road. This is at the intersection of the two. For a Mcdonalds eatery? Keep it.